Place A MatJack Under Your Load and Inflate – It Really Is That Easy! A high quality Air Lifting Bag designed to complement load moving equipment in the material handling industry. Manufactured in Kevlar material, or steel woven mesh, these terrific lifting accessories are the ideal alternate lifting equipment to assist in placing Hovair Systems load moving equipment – air caster bearings – in the correct locations before commencing operations. MatJack Air Lifting Bags go anywhere you have one inch clearance beneath your load. The lifting bag has a raised, conical, interlocking surface that is designed to “grip the load.” Excessive gaps can be bridged with strong plywood or other types of lumber. offer diverse capabilities throughout a wide range of product models. Starting at 1 ton lift capacity the range goes up to 70 tons – with many models in between. It is worth noting here that all models have an approximate lifting height at a certain “optimum” weight. This is not necessarily the maximum weight capacity of the air lifting bag. A bag’s lift height maybe less than stated depending on the weight and position of the load being lifted. 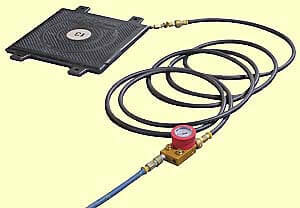 Look for Hovair Systems recommended weight capacities for optimum use in the specifications table.